It’s Friday and we’re ready for a new giveaway! 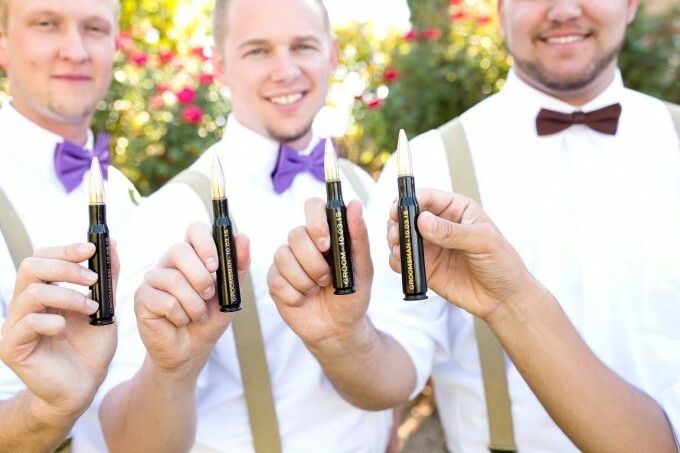 This prize is perfect for groomsmen (or your bridesmaids would love it, too!) We’ve teamed up with Bottle Breacher to give a set of three engraved bottle openers with gift boxes to one lucky winner. You can choose any finish including chrome, black, brass, blue, red, white, pink and turquoise. These bottle openers are handcrafted from real 50 caliber ammunition by military veterans. They’re also proudly made in the USA! (You might even remember their appearance on Shark Tank!) Read on for a chance to win! RELATED: Giveaway: Win FREE Bridal Earrings! I think that the product that I personally like the most is the turquoise maid of honor gift 50 caliber bottle opener. I really like the color of it! I think I like it the most because it is the most girly one that I could find! 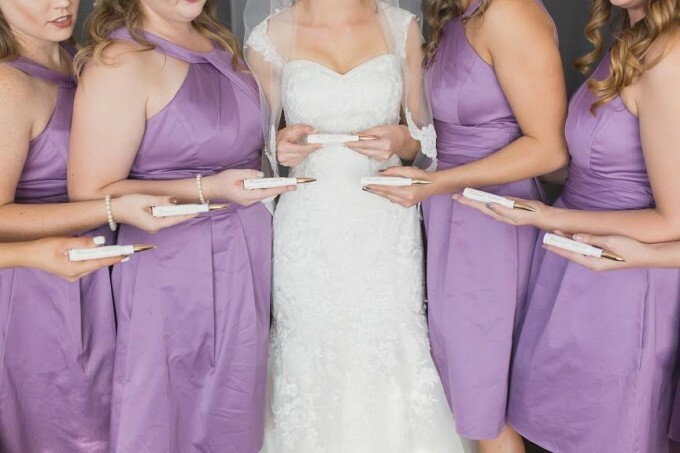 The bridesmaids engraved bottle openers are the perfect gift, many forget that us women love beer as well. They are a perfect gift for those perfect ladies in your wedding. i love the key chain bottle opener! The Fireman gift is pretty sweet! These bottle openers would make a great present for the groomsmen. The chrome 50 caliber bottle openers are awesome and would make for a sweet gift for my groomsmen. Engraved Chrome .50 Caliber Bottle Openers. I love the Bass Fisherman opener. The Groomsmen Golf Set is really cool! All my fiance’s groomsmen will love these! The .50 cal bottle openers are a pretty sick groomsmen gift! Groomsman Gift Wine Bottle opener is pretty cool. My fiance would be stoked for these bottle openers, but I am LOVING the wine breachers! Awesome! I love the American Flag 50 Cal Bottle Opener especially because my fiance is in the military! Ah!! I saw them on Shark Tank, but I didn’t realize you could engrave them! Amazing! Loving the wine breacher. love the chrome bottle opens. this would be a great groomsmen gift…we are having a hard time thinking of something unique! The 50 Caliber Camo Bullet Bottle Opener is absolutely so cool! I didn’t know these existed! A MUST for groomsman gifts! It’s hard to pick just one that I like the most but I would have to say that the American Flag 50 Caliber Bottle Opener is my favorite and would be a favorite for our wedding as my soon to be husband was in the Navy and I come from a Army family. I love the police 50 caliber bullet bottle openers. I work in law enforcement and know a few guys who would really enjoy these! Love the 50 Caliber Deer Bullet Bottle Opener! We would love to have these! 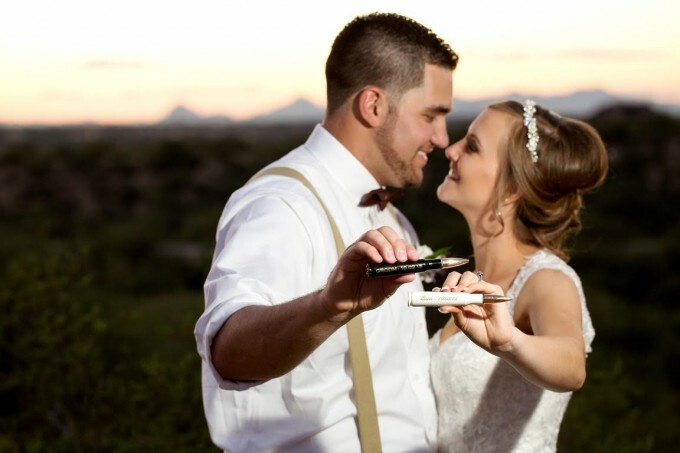 The groomsmen gift wine bottle opener would be incredible for him and his boys! The engraved .50 caliber bottle breacher is my favorite. My fiance would love these! Love the bridesmaid gift ones! Really love the camo 50 caliber bottler opener. I really like the red powder coated .50 caliber bottle opener. My friends are hunters & would love the deer silhouette. Love the 50 Caliber groomsmen gift and golf breacher. Totally unique and sharp looking! Way to run a business, good job. I don’t often have a drink, but my Pepsi bottles sometimes need help…. The chrome one is sweet! My favorite is the Bullet key chain engraved Solid Brass 7.62mm key chain Bottle Opener! We are ‘on the go’ family and won’t ever forget it! I love the solid brass keychains… very handy! I love the bass fishermen opener. The engraved groomsmen .50 caliber bottle openers would be great gifts for our guys! The Wine Bullet Bottle Opener. 50 Caliber Bottle Breacher. I like American Flag 50 caliber bottle opener. Those look awesome, Heather! Good luck! i think the Bullet key chain is pretty cool. Awesome choice, Esther! You’re entered for a chance to win. Good luck!